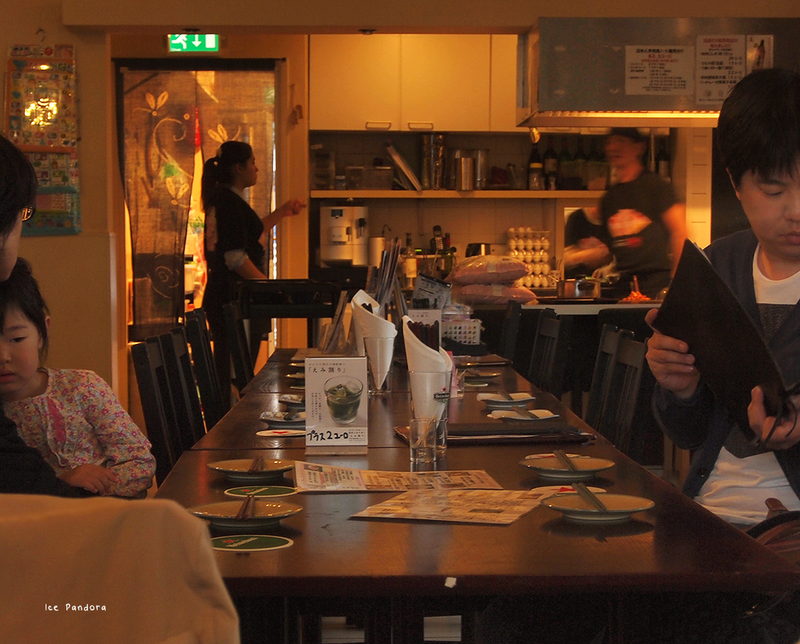 If you want to eat authentic Japanese food in The Netherlands you should go to Amstelveen which is about 10 minutes away from Amsterdam. Amstelveen also holds the largest Japanese community in my country so if you know where to look at you can find sweet hidden gems with real Japanese class such as Ishii Okonomiyaki! 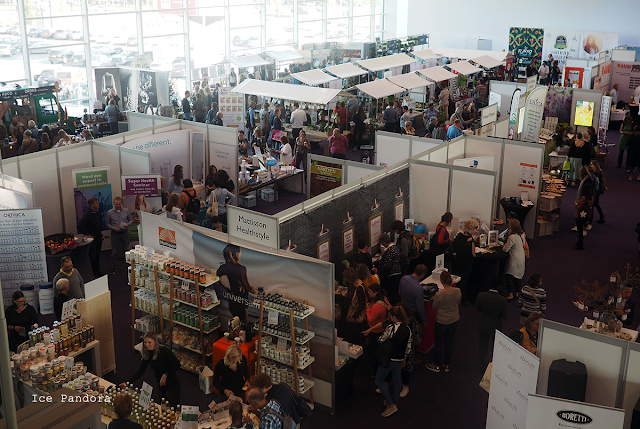 It wasn’t hard for me to find because I was with a blogger buddy Elisa who knows Amstelveen like her back pocket, hurray! After we have visit this Japanese Market we have decided to continue our Japanese adventures with dinner as well and not with sushi. Mainly because Elisa had sushi the day before but luckily the Japanese kitchen is a lot more than just sushi. And okonomiyaki is basically a Japanese pancake. I haven’t had okonomiyaki in years so I was really looking forward to try out Ishii Okonomiyaki ones! 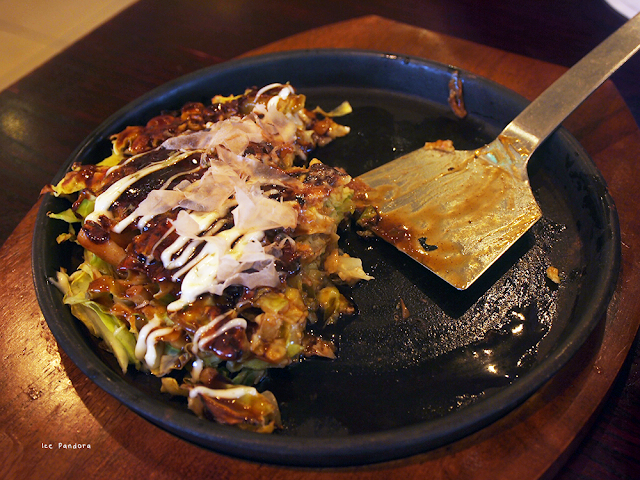 Elisa has tried Ishii Okonomiyaki before and she liked it! Lets see if I’ll like it, scroll down and read my verdict! Voor de liefhebbers van echt Japans eten - en nee, de all-you-can-eat tellen niet mee – dan moet je naar Amstelveen gaan. Amstelveen heeft ook de grootste Japanse gemeenschap van Nederland, dus als je weet waar je moet zoeken dan zul je deze verborgen juweeltjes met echte Japanse klasse zoals Ishii Okonomiyaki vinden! 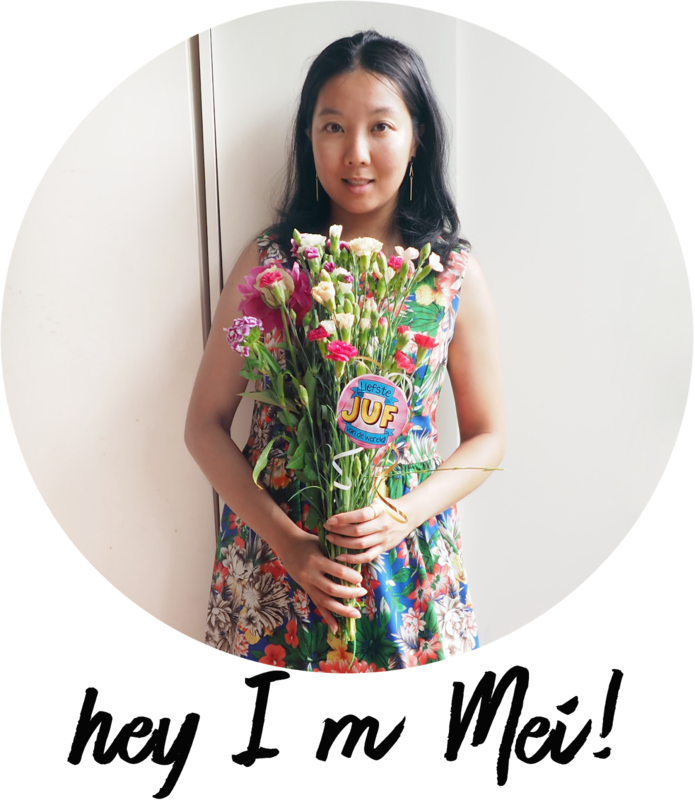 Het was niet moeilijk om Ishii Okonomiyaki te traceren want ik was met een blogger maatje Elisa die Amstelveen als haar broekzak kent, hoera! Nadat we de Japanse markt hebben bezocht, besloten we onze Japanse avonturen voort te zetten met een goed diner en dan niet met sushi. Vooral omdat Elisa al sushi gegeten had de dag ervoor, maar gelukkig biedt de Japanse keuken veel meer dan alleen sushi. Okonomiyaki is eigenlijk een Japanse pannenkoek. Ik heb al jaren geen okonomiyaki meer op, dus ik er enorm naar uit om Ishii Okonomiyaki uit te proberen! Elisa kent deze etenttent en zij is er tevreden over. Nu ik nog! Dus scroll naar beneden toe! The concentration just got real! 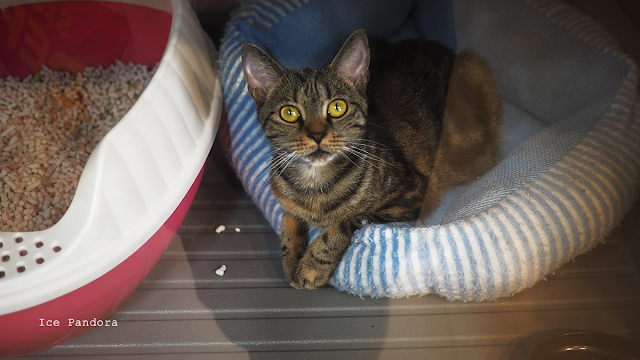 I just had to snap a picture of them, too adorable! 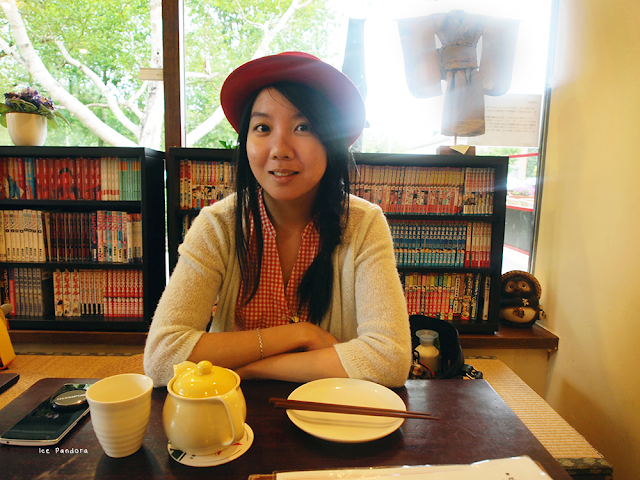 Sitting on a tatami mat bench with manga books behind me, we are ready to give out orders! Our starters are these takoyaki's, also known as deepfried balls made with minced octopus! 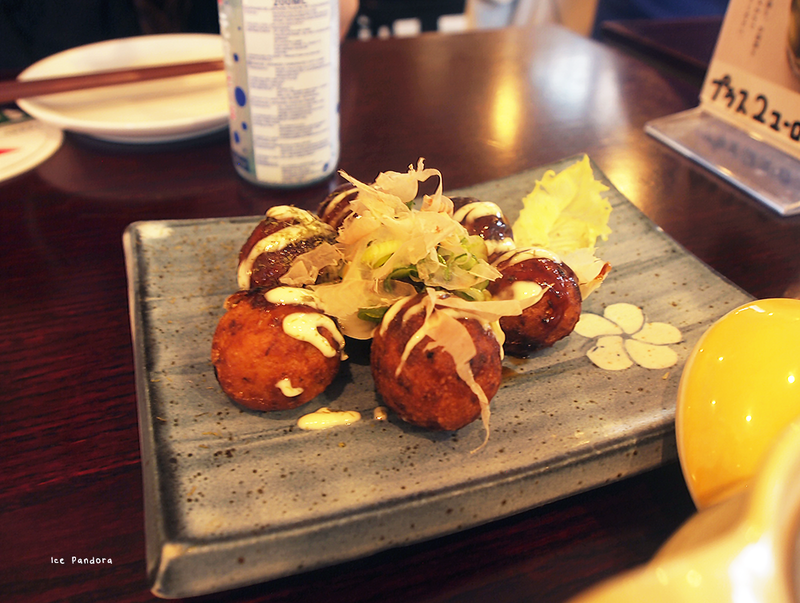 I love love love takoyaki and these were so nice and there was actually a small piece of whole octopus in the center of all these deepfried goodness! And how could we not order okonomiyaki at an specialized okonomiyaki restaurant! After many tossing and turning around the menu and options, we have finally decided to take the squid and shrimp flavor one. And it was lovely! I'm a sauce girl and I do wished to have a bit more kewpie mayonnaise drizzled on top but overall it was delicious and satisfying. Me and Elisa also shared a ramen together! 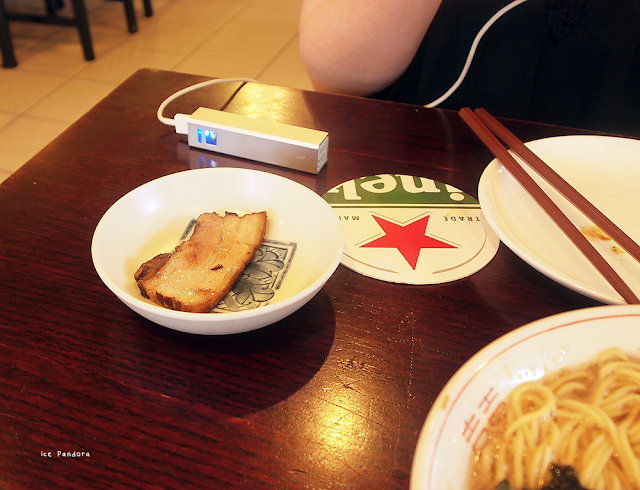 Because there were no vegetarian options available, the owner split this piece of pork separately from the ramen which is really thoughtful. The noodles and the broth (veggie broth) are really the highlights of this ramen dish. The noodles: fresh and the broth not too overpowering but just pure subtle flavoring. Maybe a nickpick of me but I did wished the egg would be a slight undercooked (runny yolks are the best). 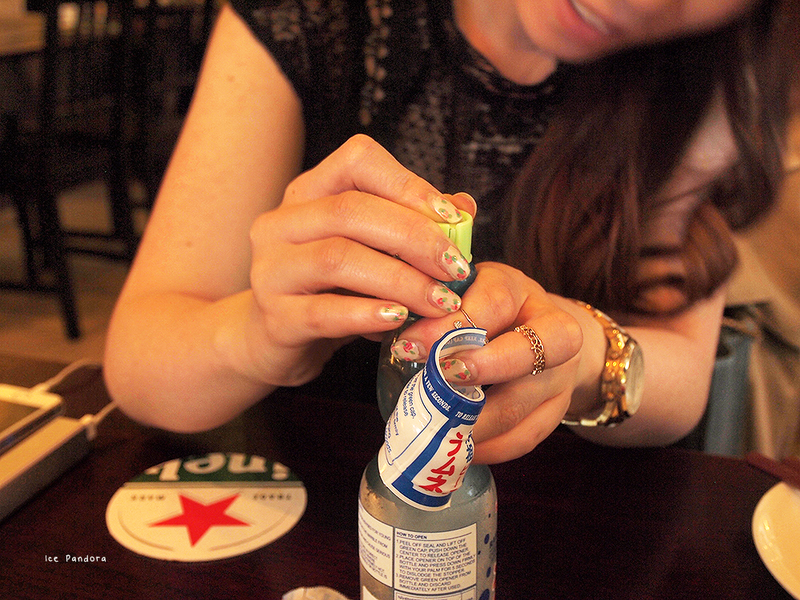 Oh dear we struggled to open the ramune bottle! But guys check out Elisa's pretty nails! 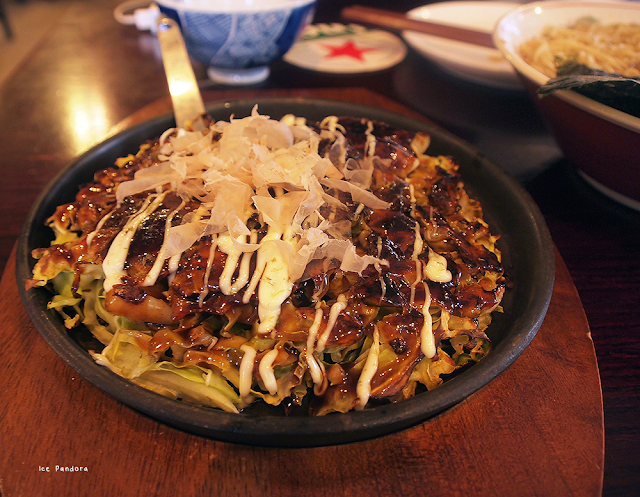 Ishii Okonomiyaki: one of the closest thing to Japan. I love it when they cook the okonomiyaki in front of you! 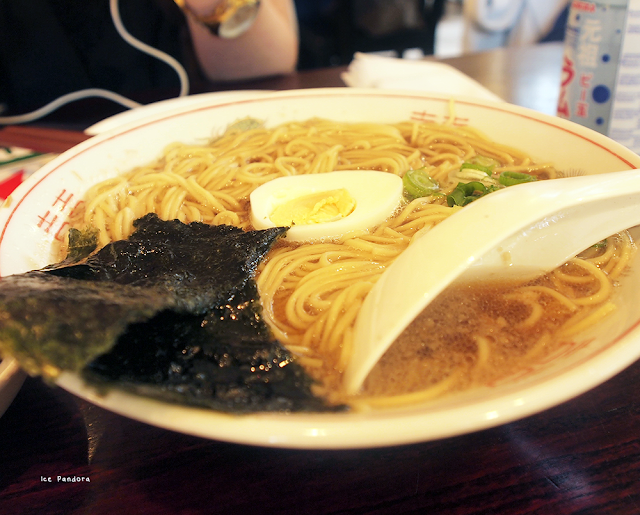 Ah the ramen looks so good, those noodles! Hi thankyou for leaving a sweet comment on my blog! One of my friend is leaving in Holland too, but I didn't know there is actually a Japanese community there, it's not a surprise for me if it is said a China Town. My friend who lives there basically only open an Indonesian restaurant. But there ain't an Indonesian community i think. Love your blog btw! how you define your blog is fab! by & let me know if you would like to follow each other on gfc or Instagram? Woae this restaurant i will save! Love Japanese food and those 2 little men how CUTE! Everything looks so yummy! We don't have any really authentic Japanese places where I live. One day I would love to visit one! Lovely place and food ! Oh yummy! I'm always grateful that it's very easy for me to get authentic japanese food in Singapore! I've yet to eat a pancake like that in a while actually, I usually go for bento sets, sushi, ramen and tonkatsus but that looks so damn delicious! 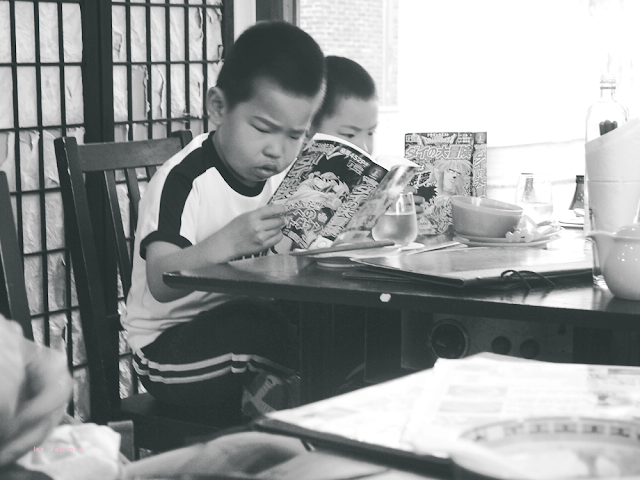 Glad that the food was good and that shot of the boy concentrating on his comic was soo adorable! Oh! Ramen and Okonomiyaki what a perfect meal! :) We have been trying to visit the only specialized okonomiyaki place in Barcelona for a while but we were waiting for cooler temperatures (Barcelona is boiling hot right now). However now with your post & pics I'm craving for it! :) ---btw, manga decor! Yum! I love ramen, takoyaki, and okonomiyaki! Those are some of my go-to comfort foods. I like that this place had mangas to read; that's how a lot of traditional ramen places are in Japan. 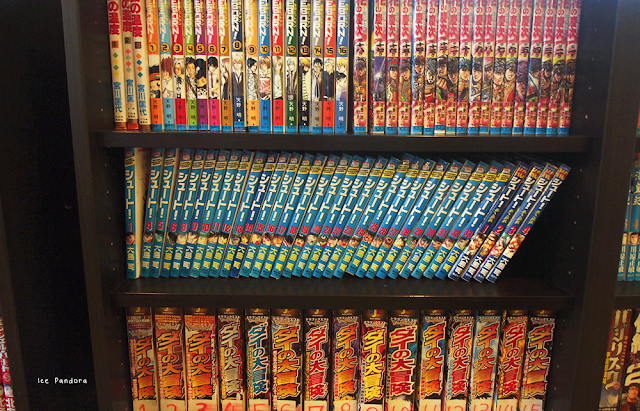 oh my gosh i love all their manga selections! there are manga "rooms" in koreatown where they have all japanese and korean manga that you can read and you just pay for the volumes you read. they are relatively cheap and people eat snacks there and sometimes food too. some are dingy where you'll only find older men and others are cleaner although by now a lot of these places have closed down due to their lack of popularity. :) i wish there was a japan town where i lived. there is one small market in DC that i like to go to and a japanese hair salon in Georgetown I used to frequent but other than that there isn't really a cluster of community. new york city though. so many! Ik moet zeggen dat dit er echt veeeel leuker uitziet dan de Okonomiyakitent in Amsterdam! Deze gaat op mijn lijstje!